Club Penguin Cheats by Mimo777 Club Penguin Cheats by Mimo777: Rookie Needs Our Help! 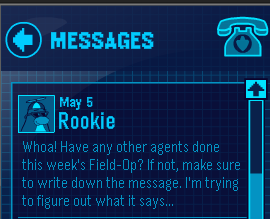 Umm, yeah, Rookie, we already figured out the message! You really are slow, aren't you? Ha! How do you think we can we help Rookie with this message? We should put rookie in a rocket and send him to Mars! Only joking! Maybe, if rookie comes back on cp we should tell him about the message!